Domain name registration is an important step for any business. Almost all businesses need to be online even if only for PR. Sometimes business owners don’t have all the information in order to take a decision regarding a Domain Name. This happens because of high level of technical information, not enough literature on the subject, and a lot of time misguided information. Every domain name contains two or more components separated by periods, called “dots”. The last part of the address, (com, net, org, us, ca, uk), is called the “Top Level Domain”. The second part of the domain is what the “Second Level Domain”. Examples of Second Level Domain are: com.uk, or on.ca. The Second Level Domains are a great way to organize geographically or functional the Domain Names, (on.ca for example is the SLD for Ontario – Canada). It is also possible to have sub-domains such as “subdomain.yourdomain.com”. I own, for instance, www.head-massage.net. I could choose to split my traffic and content between multiple websites and assign them different sub-domain names such as: practitioner.head-massage.net, directory.head-massage.net, articles.head-massage.net, etc… That is a Web Marketing or technical decision. A domain name is hierarchical and most common offers information about the type of entity using the domain name. However, for an additional charge, you can choose to keep that information private. A domain name is always needed when you want to be present on the web. It is a way to translate your server’s address into a nice looking address. Who can remember a web address like 192.168.196.231? Not me… For me, and most of us, it is easier to remember a name like dorianblog.info. Your Domain Name is your property on the Internet. It is the name of your space on Internet. Since it represents you and your company you want make it look good. Marketing and PR are other two major reasons. You want to brand your Web Site and personalize it. Search Engine ranking is another reason. There is been a lot of discussions on this subject and it seems that Search Engines such as Google, Yahoo, Bing, etc. are taking in consideration the domain name of your website in their ranking algorithm. Trademark protection is so important these days and if you don’t use a domain name that sounds like your company name someone else will use it, and reap off the benefits. There is no absolute formula for choosing your domain name but there are some guidelines. These guidelines along with a good Marketing strategy, can give you an idea of what domain name or names you should choose. Try to make your domain name as short as possible. This makes it easier to remember and get the attention of your visitors. It has to be as short as possible. People have to remember the name easily. It has to have a meaning, something that people can relate to easily. You can’t name your website tmmfalfbte.com because this is the acronym of your book: “The Massage Manual For All Levels From Beginner to Expert”. It has to be related to your company name or to your products or to a specific Marketing Campaign. I have dorianblog.info, (my name + blog), and the other one is head-massage.net, (obviously the name says it all is about Head Massage). If I had enough money and energy to finish my project to write a book about massage I would promote it through an alternate website, (part of my Marketing Campaign), let’s say learntomassage.tv which is not yet registered. This last example leads me to the next question what TLD, (Top Level Domain), should I choose. If you can, stick to the designation of the TLD. For example .com is for commercial institutions, .org is for noncommercial organizations, etc… But this isn’t extremely important. .int — for international treaty organizations – restricted and very tight controlled. On top of these there are Country Code Top Level Domains, one per country, such as .us for USA, .ca for Canada, .mx for Mexico, .fr for France, etc. New domain extensions are .tv, .aero, .biz, .coop, .info, .museum, .name, .pro and many others. Some of the CCTLD Registries require you prove that you operate or live in their country in order to approve an application for a Domain Name. Some others have even tighter rules requiring you for example a Trademark for the name you request. This however is changing and there are less and less restrictions. There are new extensions that don’t fall in either of these categories they appear, because there is a demand. There are a lot of ways to get around. First of all if your name is taken and you registered a trademark you can go to court and fight for your name. As a first step you can ask the owner to sell you the name for a reasonable price. If this doesn’t work you can ask the registry to arbitrate this. You can hire a trademark lawyer to solve this for you if none of the previous worked. If you don’t have a trademark for the name is more difficult but basically you can try all of the above. If you know you can’t win, choose something very close, use hyphens or numbers. Hyphens are better. My domain name is head-massage.net and is well positioned in rankings and search results. You will hear a lot of people saying that is better to have all letters Domain Names. I am not sure about that. Try to use another extension, with so many choices these days, it is almost impossible to not find one available. How Many Years Should I register my Domain Name? 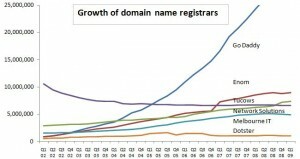 The longer you register your Domain Name the better. There are a few reasons for that. First of all is convenient to know that you have done it and you don’t have to do it for another few years. Then, some search engines give you some extra points in their rankings if you register for longer periods. That means you are serious and you plan to be there for a long time. If you register for 5 years you get a great discount, most of the registrars give you the best discount for 5 years. If you register for more than 10 years, your investment might become wasted, the technology changes so fast. For instance there are discussions about completely customized Domain Names. That will render obsolete the actual Domain Names Market. I could, for example, buy the domain name head.massage. How to protect my Domain Name and my Trademark? Register your Domain Name in multiple TLD’s. This prevents Cyber-Squatters to register your name and take advantage of it. Register a Trademark; this entitles you to dispute domain names using your Trademark. Keep an eye on the Internet for any new names related to your Trademark. There are companies that offer these kinds of services. A Registrar is usually a company that handles Domain Name registration. They are an interface between you the registrant and the Registry Administrator. The Registry Administrator, (sometimes called for short the Registry), is the authority that administrates a TLD or more and the database with all the Domain Names. Examples of Internet Registration Authorities are the country code Top Level Domain administrators, such as DENIC in Germany, or Nominet in the United Kingdom, or CIRA in Canada, which are the Administrators for the .de TLD and .uk TLD, or .ca in Canada. Most of the Registry administrators will choose to deal with you through Registrars, but some will allow you to purchase your names directly. Your registrar is an important thing since you will have to deal with him a lot. 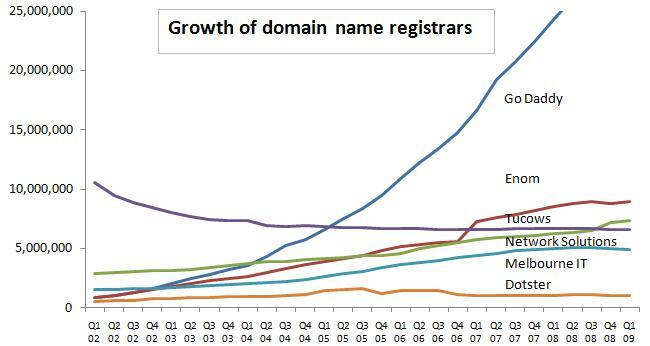 The Registrar Market is constantly changing, however big registrars are the most likely to survive over time, which is critical for you as a domain name owner. DNS hosting – is usually free with domain name purchase, there are still a few companies that charge for this kind of service. Without a DNS computers will not know where to direct the requests for your website. Web forwarding – very few companies give this as a free service. This is an advanced feature that let you specify that all the requests for a certain web-address should go to another web-address. That is handy if you purchased another company and want to redirect all the traffic from this company to your website. Website hosting – basic web site hosting is provided with a Domain Name purchase by some Registrars. For a starter the free this is a good option but this is going to give you a limited space and limited number of pages. On the other hand many companies will give you a free domain name registration if you purchase any hosting package. Make sure you choose a good and established Registrar that offers you the features described above. GoDaddy.com – World’s No.1 Domain Name Registrar , I am hosting one of my websites with them and I registered hundreds of domains for other companies. They have great prices for domains and if you know how to choose the web-hosting can be free to cheap. They have discounts and promotions all the time it’s up to you to register when you get a promotion. HOSTMONSTER.COM – great Domain Registrar and Web-site Hosting I am hosting two of my websites with them and they have a good up time and the Control Panel used to administrate the websites are great. What else Do I Need to Know when I Register a Domain Name? When you, or someone you designate, register a domain, make sure you are the Administrative Contact in the registration record. The Administrative Contact has the authority to make any changes, transfers, etc… The technical contact is someone that makes technical changes such as IP address changes, etc. Make sure all the details in the registration are correct, such as address, company name, etc, otherwise it is a real hassle to change this after creation. If you register with a TLD Administrator, and not with a registrar, you have to provide at the registration time the IP address of your server. Many times this is difficult to change and is not free. Today’s computers are under a constant assault of viruses and other malware. We all need to have up to date Antimalware software to protect our computer. Buying antivirus software and subscription could be expensive because you need to update your subscription yearly. However there are free options for your computer’s security. Malware is a general term for any software designed with the intention to affect negatively a computer or to steal private information. Malware includes computer viruses, worms, trojan horses, rootkits, spyware, adware, crimeware and other malicious software. There is a misconception that only Windows operating systems are affected by Malware. However, this isn’t true. Mac’s and Linux machines are affected as well. There are not as many viruses written for Mac and Linux machines, but this is mainly because of their popularity as Operating Systems. Windows OS is the most popular therefore many Malware programmers exists. Today a computer without an antivirus is extremely vulnerable. Especially if the computer is connected to Internet or and exchanges files with other computers, which is the case of most of the computers today. More than that, nowadays an antivirus is not enough for avid Internet users. There are so many types of threats that an antivirus alone will not protect you entirely. All computers should have an up to date Antivirus and Antispyware as a minimum. Sometimes, websites that seem inoffensive can infect your computer with spyware, Trojans or even computer viruses. Some websites will create deceiving pop-ups to mislead you in believing that your computer is infected. An action is requested on the next step asking you if you want to scan your computer. Many times you don’t have the choice to refuse this action as the pop-up special crafted and you cannot close it. The best thing to do in this situation is to save all of your work and logoff or reboot your computer. Advanced users can alternatively kill the task from the task manager. There are a few good choices for people who don’t want to pay for their computer security. There are free antivirus, free antispyware, free personal firewalls, and free anti add-ware. The vast majority of them are only free for personal use. In other words, if your computer is a company computer you should buy a license. Don’t forget that you need to have at least an antispyware, an antivirus, and a firewall to be protected, or software that combines all of them. A firewall is a must for any laptop, since connecting your laptop in other networks puts a serious threat on the security of your computer. Depending on how your home firewall is configured, if you own one, you might need a firewall on all of your home computers. 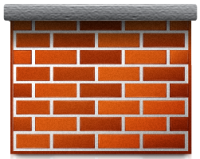 A basic firewall is included with all modern operating systems so you don’t need to buy one. However, if you need a more advanced personal firewall that gives you a very granular control of all your network and Internet activity, in and out, you should consider the free Sygate Personal Firewall, or Online Armor Free, or Comodo firewall which is part of the Comodo Internet Security suite, or Sunbelt Personal Firewall. Spyware is one of the most common Malware today. Spyware can range from almost inoffensive pieces of code to software that will damage your computer and make you lose data or steal private information from your computer. A computer without an antispyware protection will be, sooner or later, affected by spyware. There are a few free Anti-spyware products on the market. I will first mention the free for anyone “Spybot-S&D!”. It is a good antispyware with a long history on the Market. You need some computer knowledge to configure it for best results. If you need a scan only free Anti-Spyware it’s one of the best choices. Ad-aware, the known anti add-ware has evolved to an antispyware program. There is a free limited version. Windows Defender is Microsoft’s antispyware solution. Windows Defender is now part of the operating system with Windows Vista and Windows 7. There are Free, (for Personal Use), Security Suites that include antispyware as part of the bundle. See the Security Suites for more antispyware. Antivirus has always been a must for any computer that exchanges data with other computers in any way. There are viruses that can even render your computer useless. For instance the virus CIH will corrupt your computer BIOS. The BIOS chip is essential for starting your computer. Other viruses will trash all your hard drive data. Free antivirus programs exist on the market. ClamAv is a free, open source, antivirus for both personal and commercial use. Other free for personal use Antivirus include Avira Antivir, Kaspersky Anti-Virus free edition, Norton Security Scan and eTrust EZ Antivirus as a one year trial. There are also free online scanners, many antivirus manufacturers provide an online scanner for free. Security suites are sets of Anti-Malware programs designed to protect against more than one threat. They can contain an Anti-Virus, an Anti-Spyware, Anti-Phishing, a firewall, an Anti-SPAM, as well as other protections against Malware. They are the choice of most of us since they are easy to administrate and don’t require advanced computer knowledge. Very popular Free Security Suites are AVG, Avast, Comodo Internet Security, Google Pack – a collection of software that includes an antivirus and an Anti-spyware and Microsoft’s Security Essentials. As you see, there are a lot of free choices, so not having an up-to-date Anti-virus and Anti-spyware is free if you can’t afford to pay for one. Share you thoughts about Internet Security and your choice of Antivirus. Email SPAM has become one of the worst annoying things associated to Internet communication. There are many things you can do to avoid SPAM. There are preventive measures and there are remedial actions. Between the two of them, the preventive actions are the best because have the least impact on you. Preventing SPAM costs less than removing and saves your precious time. Many of the developed countries have anti spam laws, that are meant to stop unsolicited email messages. Having laws against spam is great and it is a great step forward, but as an end user and an email user, you have to understand that it is your responsibility to prevent spam and to act responsible when using the email. In some countries the anti spam legislation is not very effective, so people will still send unsolicited messages, crafted so they will abide the law. Because email is using the Internet, it is basically open to abuse from any country without specific legislation. What Can You Do to Prevent Email SPAM? First of all do not give your email address to dubious sites or people you don’t trust. If you need to subscribe to various doubtful sites you need to create a second email account that you can easily discard when the SPAM level becomes intolerable. Even better, have three accounts. At least one account should be dispensable. Do not publish your email address on your web-pages. These are regularly scanned by spammers to harvest addresses. Use web – forms instead. These forms will allow people to send you emails but they will hide your address from spammers’ eyes. When filling registration forms online, look for the box that requests future offers, or subscription to news-letters and select or deselect as needed. Do not forward chain letters or, if you really need to, the article Stop Chain Letters – Anti Spam talks about how to prevent spammers to harvest addresses from your email correspondence. BCC is your friend against spammers. When sending messages to many recipients at once, use BCC to insert all the destination addresses. This field (blind carbon copy) hides the addresses of your recipients. Read this article for more information. Your work email is only for work. Do not mix your work emails with the personal ones, this is actually part of the Anti Spam IT policy of many companies. Many Government Agencies and Institutions use email as a way of communication. You should use a special email account only for this kind of communication. This might even be a free account like “Gmail” or “Live” accounts. This will avoid getting this important account spammed. If you don’t know the sender of an unsolicited email, delete the message immediately. Never buy from unsolicited emails. You might get scammed and end up on a spammers’ list. 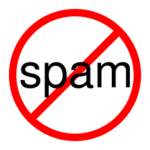 Do not answer spam messages and do not click on any links in spam messages. The “Unsubscribe” links on spam messages are just a way to trick you to confirm the spammer that he has a good address. Generally speaking, reduce the exposure of your email address in any way. Use dispensable accounts for dangerous activities. What can you do to remove SPAM from your mailbox? Unsubscribe from any news-letter that becomes annoying. Sometimes you subscribe to a newsletter and it is fine for a while and in time they decide to send you more emails. I was surprised by the number of people that tolerate unneeded messages and do not unsubscribe. As underlined above do not unsubscribe to unsolicited email messages, you will only make it worse. As a last resource give up the email account and create a new one. Inform all your friends about your new address and set an auto responder informing about your new address. Spam emails are automated there isn’t a person who is reading the bounce backs or replies, therefore an auto responder with the new address will be only read by real people. What can you do to help the fight anti spam? Spread the word. Give your friends the address of this page. Translate this page in other languages. Comment on the bottom of the page with other suggestions. Publish a link to this article on your website or give us your thoughts about other anti spam solutions.